AS I walk down St Louis Street and turn right towards Sri Aurobindo Ashram, I discover a new signage, #Dilliwaala6, and I am immediately curious. 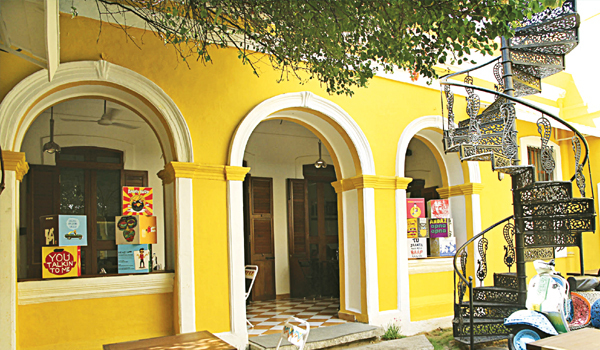 Soon Surabhi and Saurabh Dabas welcome me into a 180-year-old yellow-and-white French villa with bougainvillea along the walls, which is now a 90-seater restaurant. Both engineers from Delhi, Saurabh has been in Pondicherry for 30 years and Surabhi moved here last year after their wedding. a�?We believe food and travelling go hand-in-hand and trying out new cuisines have become a passion. This, coupled with the dearth of authentic North Indian restaurants here, led us to #Dilliwaala6,a�? says Surabhi. a�?Old Delhi is often referred to as Dilli 6, and our address is also 6, Rue De La Marine. Hence the name,a�? chimes in Saurabh, pleased with the play on numbers. The authenticity of the heritage villa has been retained, though the couple have filled it with everything a�?Dillia��. A hand-painted Chetak scooter reminds me of old Delhi, while the walls have been left untouched to echo the story of the villa. While debating the best table in the house, I discover that Surabhi loves the courtyard at the back (with a well and pergolas), and Saurabh prefers the quaint room between two other courtyards, which offers a great view of the place. As I take a seat and browse the menu, I am surprised by how well-priced it is. a�?Our target audience are families and college students. In the mornings, people can come in for our sandwiches, especially the Bombay masala, and the aloo pooris and stuffed tandoori parathas. For lunch and dinner, there are thalis, chaats and more,a�? says Saurabh. We tuck into a delicious paneer tikka naan pizza with a whole-wheat base, followed by a tasty katori chaat, made with a home made potato stick basket filled with chutneys and sweet curd. Next, some paani puris help to clear the palate, before we dig into peanut aloo tikkis and a wonderfully tender char-grilled paneer tikka. We try some spicy chole with paneer-stuffed kulchas for the main course and end with a satisfying shahi tukda (toast with cream). Keeping the season in mind, I learnt that their Navratri thali and chaats cater to those who are fasting, while there will be specials introduced every month and a new menu for Diwali this month.